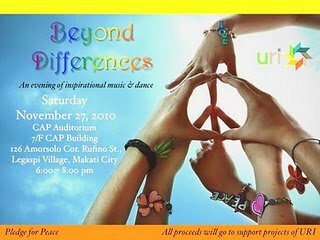 United Religions Initiative Southeast Asia & the Pacific (URISEAP) will have an interfaith, intercultural dance and music event on November 27, Saturday from 6:00 to 8:00 PM at the CAP Building, Makati City. The event is entitled "Beyond Differences." The event features Dya Singh of the Dya Singh World Music Group (Australia) and Uncle Reg Blow (Australian Aborigine) on the Didgeridoo. Also, dances and music from Bali, Cambodia, Malaysia, India, and the Philippines! Get a ticket now for Php 250 (includes a drink). Funds raised shall be used as seed grants to empower women and the youths.